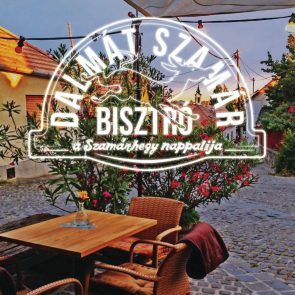 We serve Balkan dishes, a wide variety of coffee and a unique selection of wines by Bükkös Stream in the heart of Szentendre. 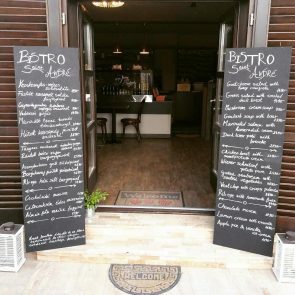 Saint André Bistro is a family-owned business made by my really loved husband. We try to do our best, everything we learned in Seville, Bordeaux, Paris, Budapest will be seen on the dishes we make. 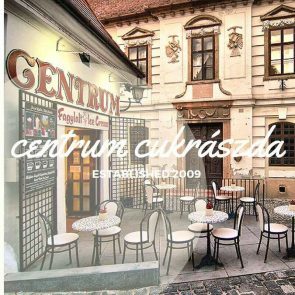 After all these cities, we fell in love with Szentendre and when the opportunity came, we opened our very first restaurant the 5th April 2018. We try to use fresh ingredients from local sources, working towards a zero environmental footprint. Everything is homemade, that’s why our menu is a small blackboard that changes as the weather does. The tables for one and two are perfect to enjoy the aroma of your favourite coffee on our terrace, where you can chill out in the summer. Our whole choice of coffee is also available for take away. Taste our delicious caffè macchiato or the espresso of our daily offer. Fresh roasted 100% arabica coffee with chocolate and vanilla flavouring. You can also choose a decaf or lactose-free version. 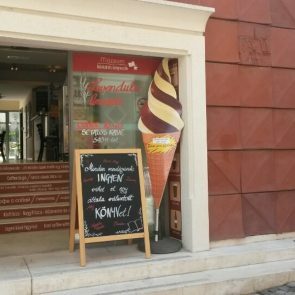 Many say that it is the best cake and ice-cream shop in the centre of Szentendre. 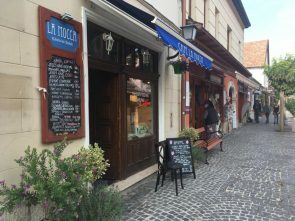 Address: Fő tér 7. 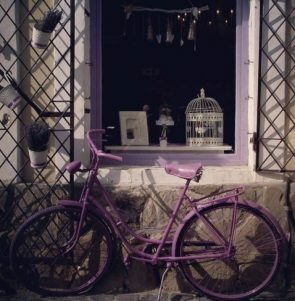 | This shop is on the Main Square. 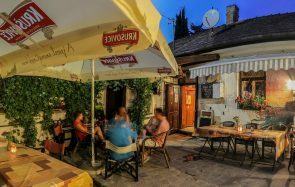 A true pearl in the romantic treasure trove of Szentendre just far enough from the deluge of tourists with two nearby lookout points with a magnificent view of the Danube and Szentendre Island. 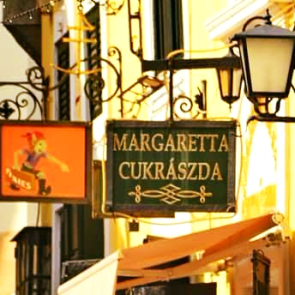 You can access Kmetty Square, where the small bistro is located, through alleys and narrow streets. The terrace with oleanders has a genuine Mediterranean atmosphere. 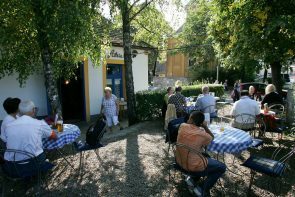 The small building has a friendly family air to it and the bistro has a wide choice of food and drinks. 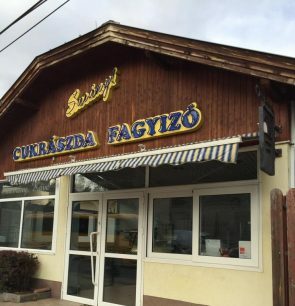 You can find Hungarian and international dishes as well as seasonal offers and varied weekly menus to fit all tastes. 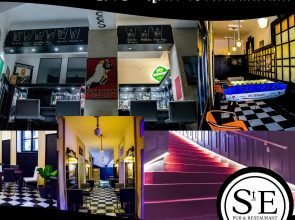 The choice of drinks includes quality wines, liquors, cocktails and coffee specialities. The dynamic and cheerful young staff makes sure you enjoy your meal or drink. The place if also a haunt for artists, who surprise guests with a new exhibition every month. This specialised chocolate, coffee and tea shop was established in 2003. 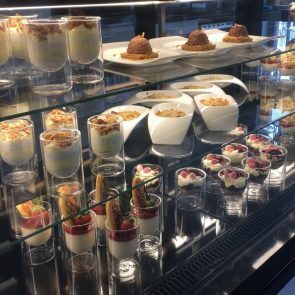 It has a wide choice of tablet chocolate, more than 80 types of fresh bonbons, fresh roasted coffee, home-made hot chocolate and loose-leaf teas in the oldest building of the street. Continuous exhibitions, performances, live music, coffee specialities and craft beer. 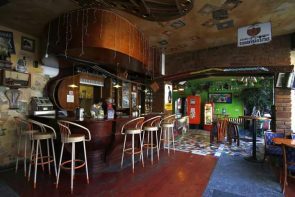 This is the place where even the bartender is an artist, where paintings change hands between two spritzers and where you’ll find red geranium in military boots. Holed up in the heart of the town, this special little café is one of the favourite haunts of young locals. Apart from the delicious food, there are also cultural events (concerts and exhibitions). 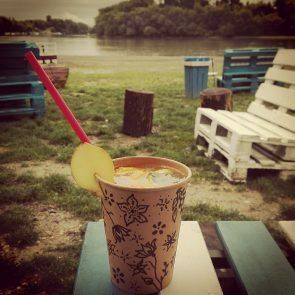 Czech draft beers, spritzer, lemonade, cordials, smoker food, deck-chairs, live concerts and camp fires. The Mediterranean-style café and restaurant has a spacious interior area with a terrace, a cozy garden and friendly service. Walls are decorated with 3D paintings. More than 100 flavours of hand-made artisanal ice-cream from natural ingredients without artificial additives. 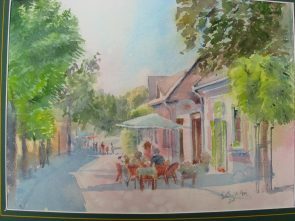 Address: Fő tér 8. | This shop is on the Main Square. The shop was founded by Lola Balogh in 1954 and it moved to its current location in the town’s pedestrian street in 1975. 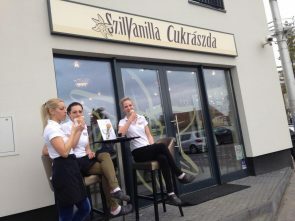 The family business continues to makes ice-cream according to the founder’s old recipes using fresh fruit and no additives. 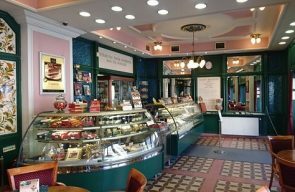 The shop offers locally made artisanal ice-cream and cakes and coffee specialities. 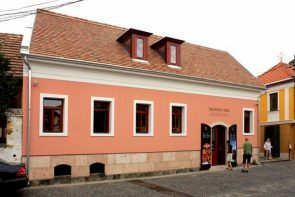 Margit Kovács Ceramics Museum has been the pride of our town for 40 years. 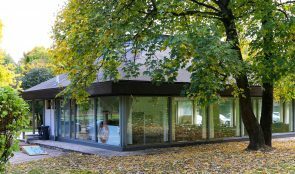 Some years ago the whole museum was refurbished and a café and bookshop were set up by the entry. 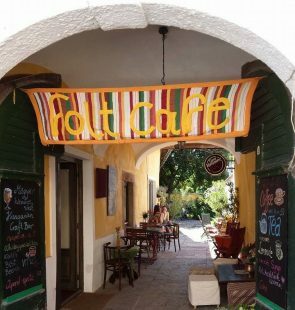 The barista-owner guarantees that you will have the best quality coffee specialities which you can drink on site in the garden or take away. Offline Center offers high-quality and unique programmes. Cultural space, community site, restaurant, pub and café. Daily menu from Monday to Friday, free concerts and vernissages. Address: Fő tér 11. 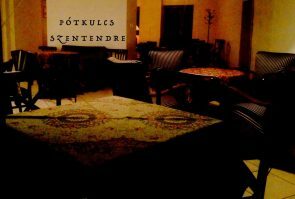 | This café is on the Main Square. Taste the sweet and salty bakery products made in the traditional wood-fired oven of Skanzen and have a nice cup of coffee in the Skanzen bakery in the town centre. 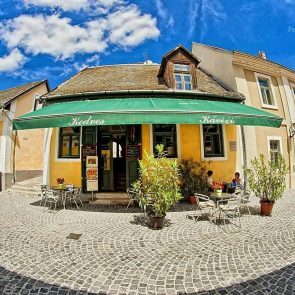 The restaurant near the Town Hall in the centre of Szentendre serves high-quality food in a great atmosphere. 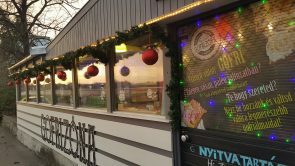 Sports broadcasts, home-made food and budget-friendly prices. With the more than 300 different shapes of cake the shop makes, it also worth calling in and tasting a slice. The fresh and varied offer awaits guests every day. 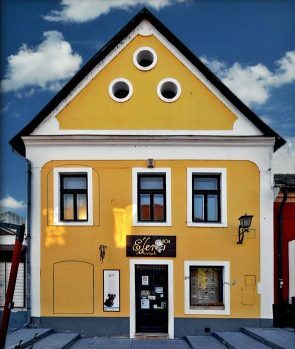 The shop offers different types of delicacies and you will find several interesting exhibits in the nearby Marzipan Museum. 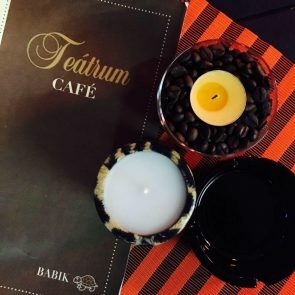 The place is one of the most recently opened confectionery shops in town with cakes, ice-cream, coffee, tea, hot chocolate and a cozy atmosphere. The shop also has sugar-, flour-, egg- and lactose-free as well as paleo cakes.